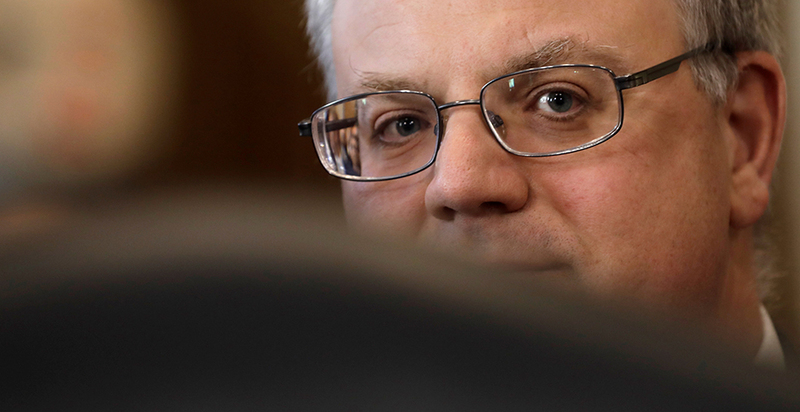 While Interior's Office of Inspector General is taking a preliminary look at a conflict-of-interest complaint lodged against Bernhardt, he has issued his own new directives this week to the department's top ethics officer. The blend of finger-pointing and taking charge does not seem to have endangered Bernhardt's prospects before the Republican-controlled committee or the full Senate, though it could foreshadow more to come (Greenwire, April 2). "For too long, the department's ethics program has languished," Bernhardt asserted in a note sent yesterday. "We must promptly transform the ethics program to meet the challenges of today at a faster pace." Bernhardt directed the department's ethics officer to develop a plan within 30 days to consolidate the various Interior bureaus' ethics offices into a single departmentwide office. Currently serving as acting secretary while he awaits Senate confirmation, Bernhardt ordered a "technology assessment" of the ethics program to ensure effective tracking of things like training and financial disclosure filing. He also urged development of an "ethics app" that the department's approximately 70,000 employees could "easily access on their mobile devices while in the field and in remote locations." Bernhardt's directive responds to criticisms in a Government Accountability Office assessment issued last month (Greenwire, March 18). In November 2018, for instance, the Interior ethics office reported that out of 14 full-time positions, four ethics attorney positions were vacant. Interior officials said the vacancies resulted from prioritizing the staffing at individual agencies such as the National Park Service over the department-level ethics office, which oversees political appointees. During 2017, one Interior official was responsible for reviewing and certifying more than 300 public financial disclosure forms. "The official was unable to balance proper and timely review of forms with other responsibilities that also included reviewing and certifying more than 800 confidential disclosure forms," GAO reported. Bernhardt's ethics memo yesterday also happened to come on the same day the Campaign for Accountability, a nonprofit watchdog group, announced that Interior's Office of Inspector General confirmed it is reviewing a request for investigation into Bernhardt and his relationship with his former lobbying client, Westlands Water District in California. "We are reviewing the information you provided, in addition to other information available to us, in order to determine the appropriate next steps," the IG wrote. Under his ethics pledge signed Aug. 10, 2017, Bernhardt committed not to participate for two years in any "particular matter" on which he lobbied within the two years preceding his Interior appointment. Several complaints assert Bernhardt may have broken that vow with discussions over California water deliveries that could benefit Westlands. "We're glad the Inspector General's office is reviewing the matter, and we hope they will conduct a full investigation to determine whether Mr. Bernhardt violated ethics rules," Daniel Stevens, executive director of the Campaign for Accountability, said in a statement. Separately, Sen. Ron Wyden (D-Ore.) last week urged the IG to examine Bernhardt's handling of the Fish and Wildlife Service study that examined the impact of several chemicals on vulnerable species. "I am deeply troubled by what appears to be a political appointee meddling in the scientific process at USFWS in its analysis of toxic pesticides and their effect on the environment and hundreds of endangered species," Wyden wrote. Citing the complaints, Wyden today called for the committee vote to be delayed.